82.We got a new member Takanobu. 81.Otoco Cue got linked to TEAM NARU. 74.We got linked to LANIKAI. 73.We got linked to MAXi. 71.TAO SURF　got linked to NARU. 62.We got linked to JWAVERS. 43. We got linked to graniph. 32. Wind Avenue　got linked to NARU. 24．Yahoo Japan　got linked to NARU. 23．We got linked to　JWAVERS WEST. 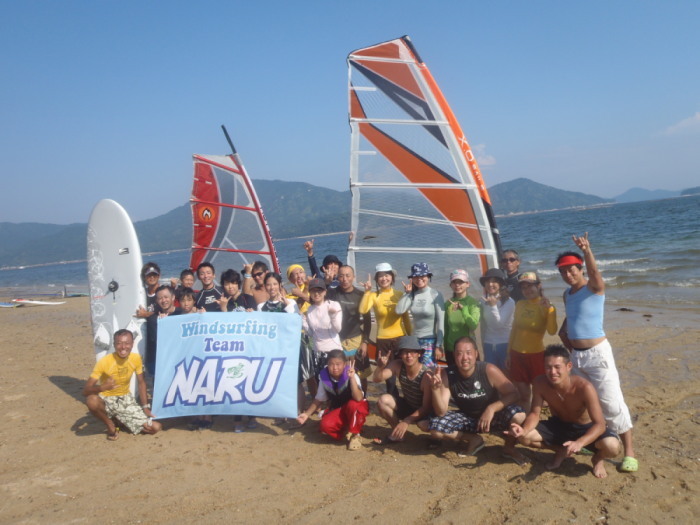 NARU beach is on Hiroshima's west coust. I am waiting for your contact anytime. Let's go windsfurfing，SUP　and enjoy. From Ｉｗａｋｕｎｉ ｔｏ Ｈｉｒｏｓｈｉｍａ ：Ｔａｋｅ Ｒｔｅ．２ for 3min. past Otake Interchange. From Hiroshima to Iwakuni：　Go past Miyajima on Rte.2. Keep going past Miyahama hot springs and through　the tunnel. Club House with storage space. Next to Naru house, ７cars. 20m.-away, 6cars. Family restaurant,　Ramen shop etc. 1. In Otake many outdoor things to enjoy. 2. World heritage site:Miyajima is about 10min. by car. 3. Iwakuni Kintai bridge is about 25min. by car. 4. Narukawa is famous for its oysters. Many oyster shops near Narukawa. ※If you would like our pictures let us know. １．Wind conditions around Hiroshima. Member introduction. Recent windsurfing. ２．To spread the fun ｏｆ windsurfing to many people. ３．To let the world know about our little beach. ４．To make new windsufing friends.